Hey guys, I met with a new client a few weeks ago and am soooo excited for my latest project! This young family lives literally within walking distance to uptown Charlotte in an adorable home built in the 80's that resembles a 1940's style bungalow! Now we obviously want to update this home with modern and stylish decor, but still maintain the home's character and charm that is so evident in the surrounding area and neighborhood. The clients already have a great start decorating their dining room with beautiful abstract art (in red-orange, brown and gray colors) a new dark wood dining room table and sideboard. However they want a new chandelier for above this dining room table, and a whole new look for their adjoining family room. So my goal was to create a family friendly space that is balanced, stylish and functional, that also visually ties both the dining room and family room together. 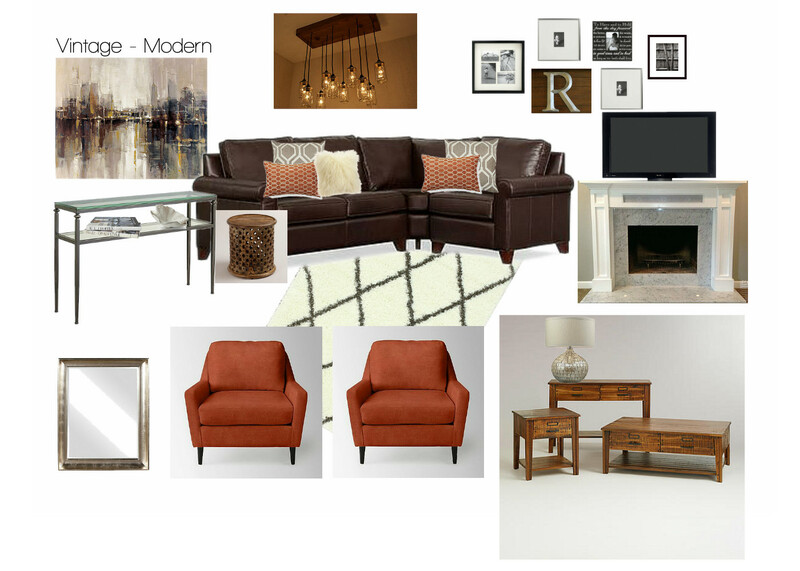 And to mix the vintage elements with the modern & wouldn't you know mixing styles is my favorite thing! I'm so excited to see this space evolve. And I hope to have some great Before & After photos when it's all finished too. In the meantime, while waiting on furniture delivery, I'll be shopping both on-line and locally for vases and accessories for their sideboard, a lamp, entry rug and mirror, and finally some frames and wall art for a fun wall gallery in the dining room! 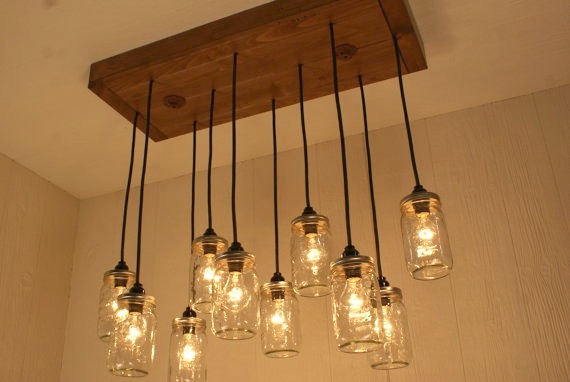 Okay guys, I sourced this hand crafted chandelier on Etsy here. Isn't it fun with it's vintage - industrial vibe! And the clients chose it, not me. I love decorating spaces for clients that reflect their personalities. After all, a well designed space shouldn't just look good - like a page from a magazine. I believe it should feel like HOME and most importantly feel like YOU! Great inspiration board. Love the colors. Thanks Marty, very neutral except for the yellow in the art and the vibrant pop of orange! Ohhh!!! My husband made me one of these.Great work!!! Love yours!